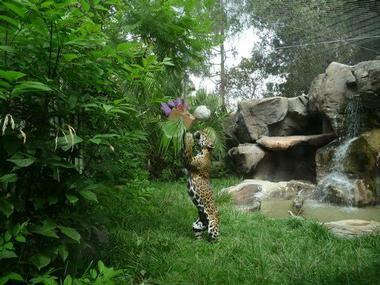 Happy Hollow Park & Zoo is a family-friendly zoo and amusement park located in San Jose, California. Established in 1961, the 16-acre park is home to a zoo with over 150 animals, a special petting zoo with an animal barn and farm animals, a handmade puppet theater, a veteninary hospital, an exclusive Fossa (lemur) exhibit, and a variety of fun, animal-themed rides, slides and playing structures for children of all ages. The aim of the zoo and park is to connect people and nature through exploration and play and to educate visitors on the natural world and the creatures that live within it. The zoo has a wide variety of animals ranging from mammals and birds to reptiles and aims to create an environment in which they can live comfortably enough to demonstrate their species-typical behavior and enhance their well-being. The zoo and park feature a full-service veterinary hospital with indoor and outdoor quarantine areas, modern surgery and radiology facilities, a petting zoo with an animal barn where children can interact with animals such as goats and rabbits, and a Fossa Exhibit, featuring members of the mongoose family. The zoo also features several conservation programs ranging from guest education and facility operations to species survival workshops. Conservation projects around the world that the zoo is involved in include cheetah conservation in Namibia, caring for wolves in Ethiopia, and habitat preservation in Belize, while locally they participate in supporting the habitat of the honeybee and caring for individual species such as Fennec foxes, lemurs, and Jaguars. Happy Hollow Zoo & Park also support Rangers in Congo's Virunga National Park to protect the world's last remaining Mountain Gorillas. Happy Hollow Zoo & Park features a range of fun and educational structures and attractions for children of all ages to enjoy. The Crooked House is a vintage attraction that has been restored to its former glory and is a favorite with the kids. A ‘green’ education building built out of hay bales is a new center of education at the core of the park and offers a range of fun-filled activities throughout the year. Doc’s Critter Care is a new animal hospital in the park with excellent indoor and outdoor quarantine areas, a modern surgery and radiology facilities. The Double H Ranch Exhibit offers a fantastic petting zoo and contact area for children to interact with farm animals, as well as exhibits of animals typically found in a barn and additional play areas. 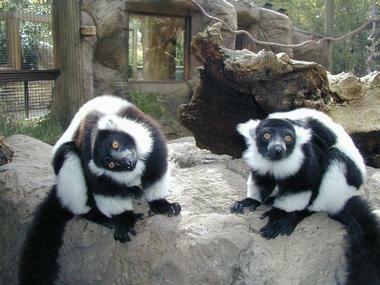 The Lemur Woods Exhibit is a unique exhibition featuring endangered lemurs with an adjacent play area for kids to imitate the lemurs at play, and Redwood Lookout is an interactive play area for multiple age groups, ranging from a toddler’s area to larger structures for older children. 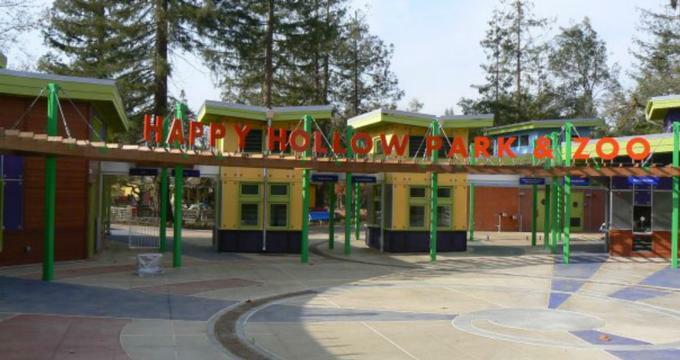 The entrance to the Happy Hollow Park & Zoo is bright and welcoming with an entry plaza featuring whimsical public art created by world-renowned artist, Tom Otterness, and the Picnic Basket Restaurant, which can accommodate over 160 guests. Other fun-filled attractions at the zoo include the Giggle Grove – an area for children with swings rides, and mini putts, a spectacular vintage carousel that features endangered species characters, an exhilarating family roller coaster, and themed rides such as the Pacific Fruit Express, the Frog Hopper, the Granny Bug Ride, and the ever-popular ‘Danny the Dragon’ ride. A puppet theater puts on fantastic shows and performances for children of all ages throughout the year, such as ‘The Frog Prince’ and ‘Maya the Brave,’ using using handcrafted puppets and props. Happy Hollow Zoo & Park offers a variety of interactive educational programs, workshops, and experiences that aim to educate, inspire and develop an appreciation for the natural world and the animals that live in it. Educational experiences range from classes and summer camps, school programs and assemblies, girl scout programs, sleepovers and ‘meet-the-animals’ workshops. Happy Hollow Park & Zoo offers a fantastic and whimsical outdoor venue for special occasions and social gatherings, from the Redwood Lookout play area or the bamboo forest near Danny the Dragon to one of seven outdoor party areas in the Giggle Grove. 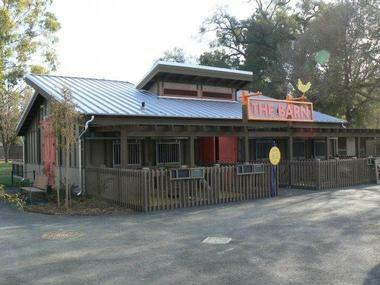 The Picnic Basket Restaurant is a family-friendly restaurant in the Park that serves a wide range of delicious and healthy foods and drinks, including sandwiches, salads, entrées and desserts, while the Explore and More Store has a selection of nature and animal-themed items, memorabilia, clothing, games, toys and souvenirs to purchase.